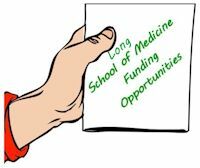 Basic and Clinical Science Pilot Program - These are pilot studies to collect preliminary data in preparation for submission to NIH and other extramural funding sources requiring preliminary data. Basic and clinical pilots are encouraged. Clinical Investigator Kickstart (CLIK) Pilot Program - Designed to foster patient-centered outcomes and/or comparative effectiveness research within the School of Medicine, UTHSCSA, and our collaborating institutions. These funds are allocated to support development activities and pilot projects that strengthen our ability to submit competitive applications for extramural funding for health services and patient-centered research.